Traveling around Iceland and making the most out of it in a comfortable and affordable way? Renting a campervan is the answer. We traveled 8 days through Iceland with a campervan of Happy Campers and did the entire Ring Road. It was our first time experiencing Iceland like this, but we couldn’t have made a better choice. Driving through Iceland with a campervan is a wonderful way to experience all its beautiful wonders at your own pace. You stop whenever you want, as long as you want. And above all, it allows you to wake up every single morning in an environment of incredible nature. Does this idea sound good to you? 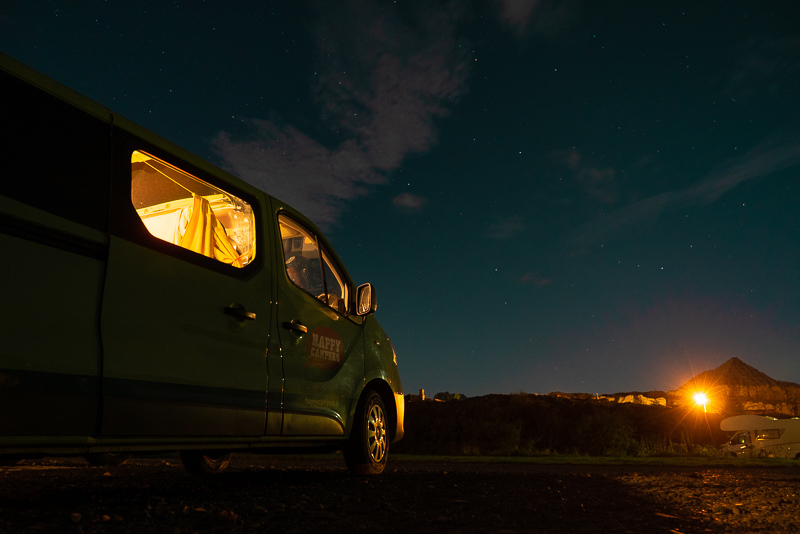 Then hiring a campervan in Iceland is definitely something for you! Here are our tips and everything you need to know to survive your trip. When is it the best time to go camping in Iceland? Camping in Iceland is possible all year round. Camping during the winter months (December to February) brings increased chances to view the Northern Lights, but it can be quite challenging. Most ideal months to go camping and driving the Ring Road are from June to September, when the days are longer and the weather is quite stable. This is also the period when you enjoy the sceneries and landscapes from early in the morning until late in the evening. 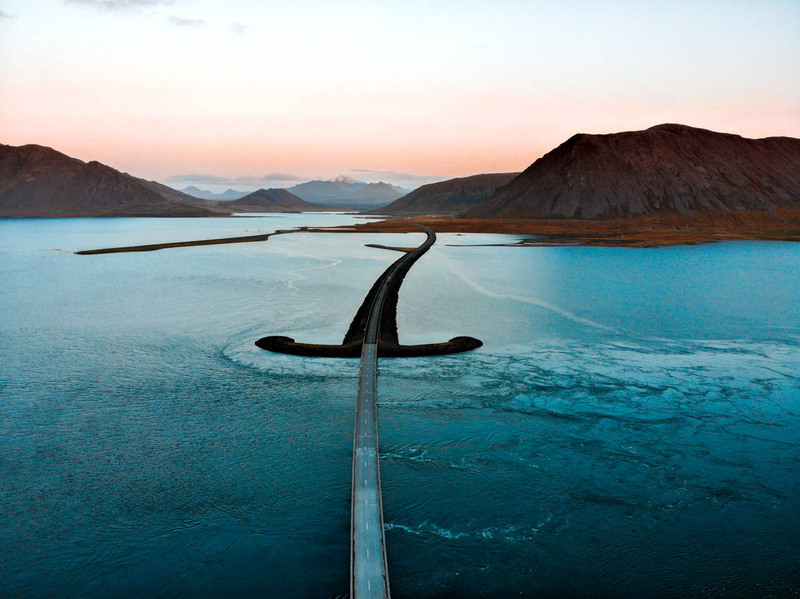 Iceland has one big main road: Route 1 or also known as the Ring Road. It’s a paved road with a total length of 1,332 kilometers and goes all around the island. Almost all the sights you want to see are found by the Ring Road. The road is two lanes wide, with one lane going in each direction. While there is not much traffic, find always first a safe spot to park your car as another car can come flying by at any minute. Next, to the paved Ring Road, Iceland has also gravel roads or F-roads (mountain roads). If you are planning on driving on any F-roads then you will need a 4WD. Before you go, always check the weather conditions. Weather can change so quickly, so driving conditions too. Especially during winter it’s not always guaranteed that the roads will be open and/or safe to travel. Can you camp anywhere with a campervan? Well, basically, yes. But regulations have been changed since November 2015. Wild camping with a campervan is now illegal, unless, you have the permission of the landowner to camp on their land. But to be honest, there are so many campsites available in Iceland and they are usually very cheap, around 10 – 15 euro per person so wild camping is even not necessary. Do you need to book campsites in advance? “First come, first served” that’s how it goes. You can’t book campsites in advance, but no worries because they rarely get completely full. Check out this great map below for all campsites in Iceland, both summer and all-year round. What are the highlights you really need to see? If you have one week or 8 days like we had, which is about the minimum time you should take to drive the entire Ring Road, you can see and experience almost all famous highlights in Iceland. One of our ultimate favorites were Kvernufoss waterfall, Fjaðrárgljúfur canyon, Seljavallalaug which is the oldest swimming pool in Iceland, the Myvatn Nature Baths and photographers paradise Stokksnes beach. And of course, The Golden Circle, where you get to see the highly active Geysir, Thingvellir National Park, and Gullfoss Waterfall. 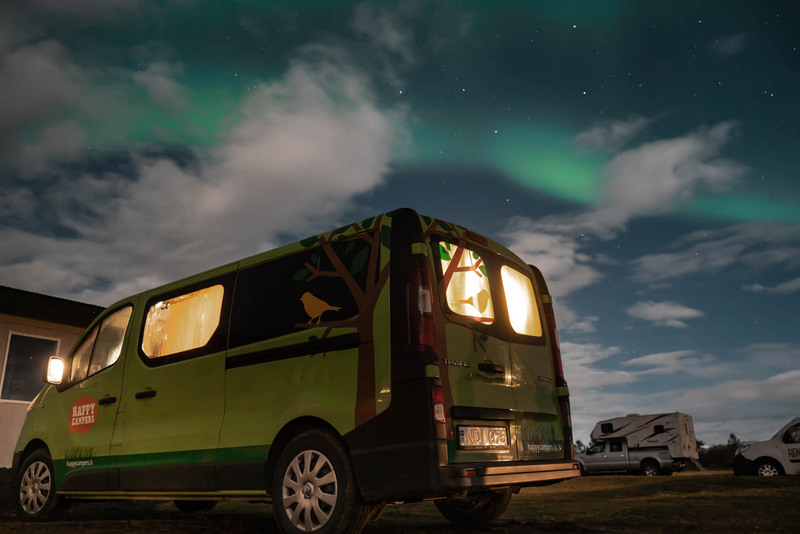 What is the best campervan rental in Iceland? There several rental companies in Iceland where you can choose from. But if you ask us, we say Happy Campers! This extremely friendly family run business attracted us from the very first moment. Not only their excellent reviews and free airport pick up, but also their lovely colored vans looked so pretty. And when you’re on the road crossing another Happy Camper, people start waving. You really feel like you’re part of the family! The campervans are fully-equipped with everything you need from pillows and blankets to cooking supplies, a sink with running water and most important: a heater! And on top of everything… they go green by using a solar panel on each camper. This was our first ‘van life’ experience and it was way more comfortable than expected. If there is something more expensive next to the fuel prices, then it will be alcohol. So if you like to have some beers or a glass of wine after a full day of exploring, plan to buy your alcoholic beverages at the airport as soon as you arrive. Or take some bottles from home and carry them in a wine protector bag. If there is one tip we had it most difficult with, it’s this one. Choosing clothes on the spot depending on how the weather will be like would be awesome, but when you go camping you really need to pack light. So preparing some outfits at home is no unnecessary luxury. If you don’t think you will it wear it more than once, just don’t bring it with you. Yes, it does! Consider the size of your campervan before you book. A small campervan is cute and cozy, but having some extra comfort is not an unnecessary luxury. We booked Happy 2 and we were really happy with our choice! We didn’t need to collapse our bed every day and had enough space for all our gear we’d brought with us. The fun part! Go Pinteresting and mark all the places you’d love to see. On maps.me you can easily mark your favorite spots on the map to have an idea where you will spend more time than on other places and to know how your route will look like. If you’re traveling with camera gear the inverter is a must add. The inverter will transform the 12V socket (cigarette lighter) into a standard European outlet that you can use to charge all your devices while driving. And regarding WIFI, Happy Campers offers unlimited data for a single fee of 40 euro. Uploading your favorite pictures on Instagram has never been so easy. ? Inspired to discover Iceland with a campervan? Amazing! 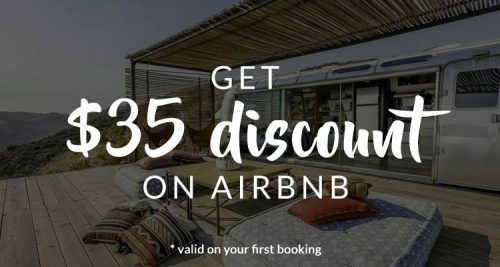 But do you also like to stay in a fancy hotel or guesthouse now and then? Be sure you check out our article about the best places to stay in Iceland where we’ve put together some lovely recommendations. 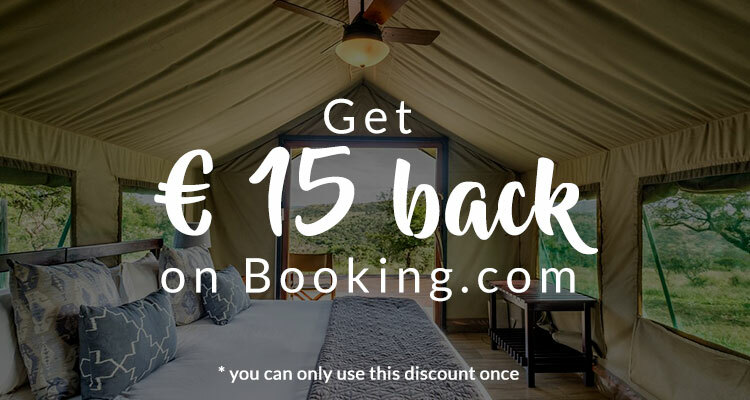 And did you know we have a €15 discount for you on Booking.com if you book via this link? Happy travels!